Keeping the prepaid and postpaid segment aside, Bharti Airtel is focusing on other ventures like 4G Hotspot device and also providing free Wi-Fi to users across the country. Before the launch of JioFi hotspot device, Airtel and Vodafone used to offer their own hotspot devices at exorbitant prices, but that has changed with JioFi’s launch. As you might already know, Reliance Industries, the parent company of Reliance Jio Infocomm is the leading hotspot device maker in India, thanks to its affordable pricing. To tackle Jio and its JioFi devices, Bharti Airtel has revised 4G Hotspot plans and it’s now providing more than 500% data than earlier at the same prices. In fact, users who choose advance rental plans of more than six months will be eligible for a free Airtel 4G Hotspot device at no additional cost. Also, Airtel is providing just two tariff plans of Rs 399 and Rs 599 making it easier for the consumers to choose the plan they want. Earlier, the telco had more than ten tariff plans in place for Airtel 4G Hotspot device users. One of the perks of Airtel 4G Hotspot, or any similar device is that it gets you 4G like speeds in even non-4G devices. Although, nowadays it is hard to find any user who owns a non-4G device, some users in the rural areas could find this hotspot worth their investment as it supports connectivity with ten devices at one time. If you want to own an Airtel 4G hotspot device, then all you need to do is buy it from the Airtel official website or Amazon. It is worth noting that the Airtel 4G hotspot is a device manufactured by the Chinese vendor Huawei and it comes with 1500mAh battery which is slated to give you six hours of battery life. 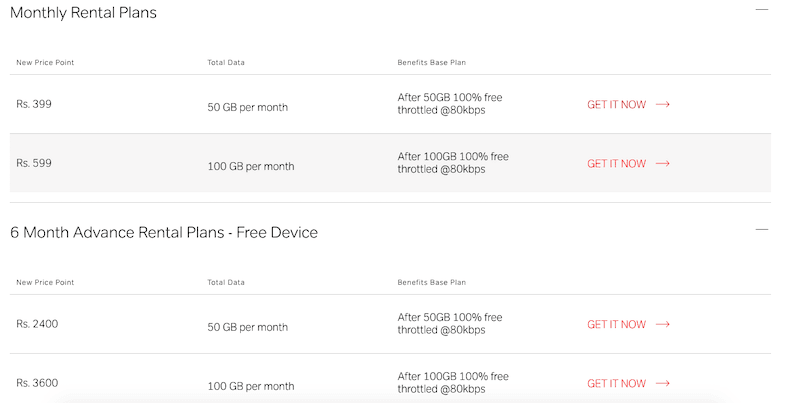 Also, it is noteworthy that previously Airtel 4G hotspot used to come with many more plan options; however, now they seem to have been discontinued as per the official Airtel website. 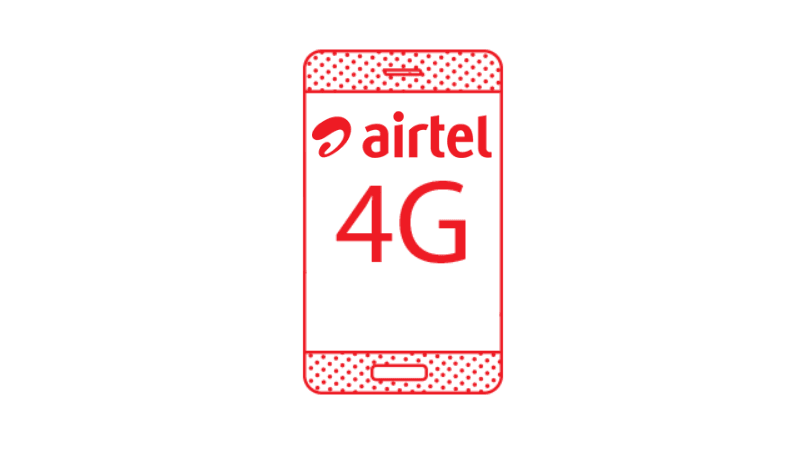 The Airtel 4G hotspot offers mainly two monthly rental plans. The first plan is of Rs 399 which packages 50GB of data per month after which users get access to unlimited data but at a throttled speed of 80kbps. The second plan which Airtel offers for its users of the 4G hotspot is the Rs 599 plan which provides 100GB data for the users with 4G speed per month, and after the exhaustion of this limit, the speed is throttled down to 80kbps. Airtel also offers six-month advance rental plans for the users of Airtel 4G hotspot, and the customers will get to enjoy perks like free Airtel 4G hotspot device. The first plan of Rs 399, when bought in advance for six months will set back the buyers by Rs 2,400. However, the buyers will save Rs 999 as they won’t have to pay for the device upfront. Similar will be the case for the 100GB per month plan which will be available for Rs 3,600 for a six-month subscription period. Very expensive. Prepaid plans are much cheaper even if you buy the device for 1000 RS. you get better data offers plus longer validity at lesser price. It’s good to see that Airtel stepping up its game on spectrum front but it’s still lagging behind on offers front. Not able to match Jio offers yet is downside for Airtel. Airtel and Vodafone-Idea should come together to fight with Jio. Caterlization should remain in order to compete with Jio. Airtel(in current scenario) should look for maximum revenue from Himachal Pradesh,Bihar,Assam,UPE,UPW,Bihar, Rajasthan,MPCG,Haryana,Punjab, Gujarat,Andhra Pradesh and Mumbai and Maharashtra. If they don’t concentrate on these circles for next two years,they are close to dead.